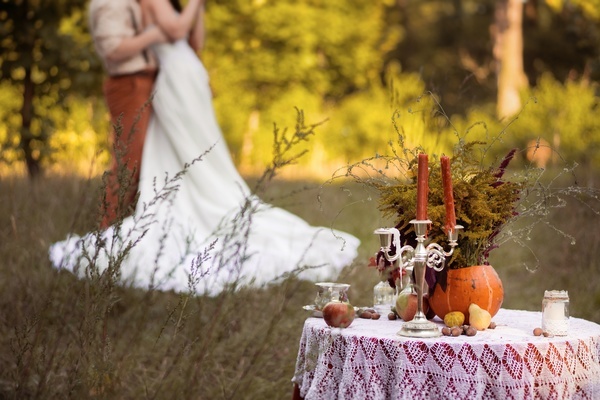 Fall is in the air and so are the sounds of Wedding bells. Yes, I know summer seems to be the big wedding season here in Northern Kentucky, but if you are a Fall Fan, like me, you LOVE the beauty of this season. There is just something about fall that makes a soul feel good. As summer leaves, the fireworks of fall explodes in the colors of the foliage of orange, yellow and deep reds. Its beauty is unique, and provides the perfect backdrop for photo ops full of color and beautiful sunsets. I can certainly understand why for many it is the perfect season for the wedding of their dreams. You have everything in place, the perfect outdoor venue, the perfect dress all, flowers, photographer and now the last but certainly not least, the food! Again, my favorite! Planning the fall reception menu needs to leave the guests feeling warm, cozy and a bit festive. So bringing in a balanced combination of sweet and savory is a must. For the appetizers, stick with small bites with all the flavors of fall, mini grilled cheese, or some mushroom caps with sausage and cranberry are a couple of fans favorite options that will get you guests started and looking forward to the main meal. Soup, soup and more soup! Looking for something different than the normal salad option? How about offering a few soup selections. With the beautiful fall evenings soup is sure to make the guest feel right at home. There are many options that will work for this. Start with your favorite and then add another one or two options. Your guests will love it! As for the main course, remember that guests will crave comfort foods, especially here in the NKY region, we are comfort food fans. The trick is finding the balance between comfort foods and not serving up something to heavy leaving your guests ready for a nap. Beef or a cream-based chicken dish are always guest pleasers. Round those out with some seasonal sides of squash, sweet potatoes and a nice salad option and voila! Dinner is served. People often crave spicy-sweet confections during the autumn months. Think about your favorite fall flavors—like pumpkin pie, apple crisp or hot apple cider and serve them up to create delicious desserts your guests are sure to love. While these ideas are just merely scratching the surface of the endless possibilities that can happen for your dream day, the bottom line is, the menu is only limited by your creativity. That is where we come in. At Be Creative Catering, we are the creative food specialist. From our suggestions to your family favorites and everything between, we are here to bring the creative touch to your ideas. So bring us your family favorites, grandma’s apple pie recipe, or mom’s hot apple cider mix, we do the work, you enjoy your day. At Be Creative Catering we are creating memories to last your lifetime.